Hugo Boss has launched Hugo Reversed, a new fragrance for men. Hugo Reversed is a flanker to 1995's Hugo by Hugo Boss. For men who dare to challenge the status quo, HUGO Reversed presents a fragrance with a fresh twist: an urban cocktail of energising citrus, aromatic rosemary and cool, contrasting vetiver. See what happens when you change your perspective with this latest addition to the HUGO fragrance family. Additional notes include bergamot, grapefruit and pamplewood. 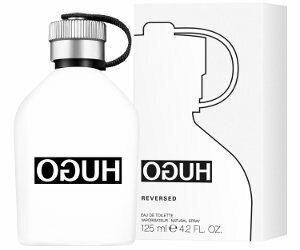 Hugo Reversed by Hugo Boss is available in 75 and 125 ml Eau de Toilette. I think there’s a whole clothing range of reverse hugo shirts & whatnot. And that is all I know about that!